Google Docs is an online solution by Google to edit word documents, spreadsheets, keynotes and other activities with other users for free. 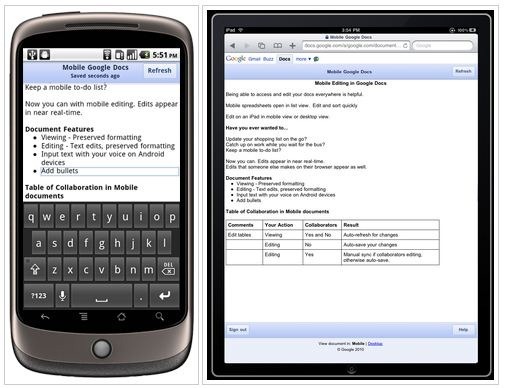 Google today has announced full support for editing and sharing of Google Docs on all iOS devices running version of iOS 3.x and Android users running Froyo 2.2. You can work on that important memo…while on the bus or train to work. Here’s a video of Google Docs in action on Android. This is probably the most detailed walkthrough of the whole deal in under 2 minutes! To start using Google Docs right now, just point your iOS or Android device’s browser to docs.google.com and you’re good to go. But keep in mind that the roll out will be gradual across the board, so you might not see the edit feature just yet, hang on tight and you will.